Innovate or die! Sure, this is true, at least in the business world. But how can we innovate our products or services? How can we find new, original strategies, to differentiate and gain a competitive advantage over our competitors? The ‘Constrained Creativity' Technique is an easy but powerful strategy to produce innovative solutions through creative thinking. 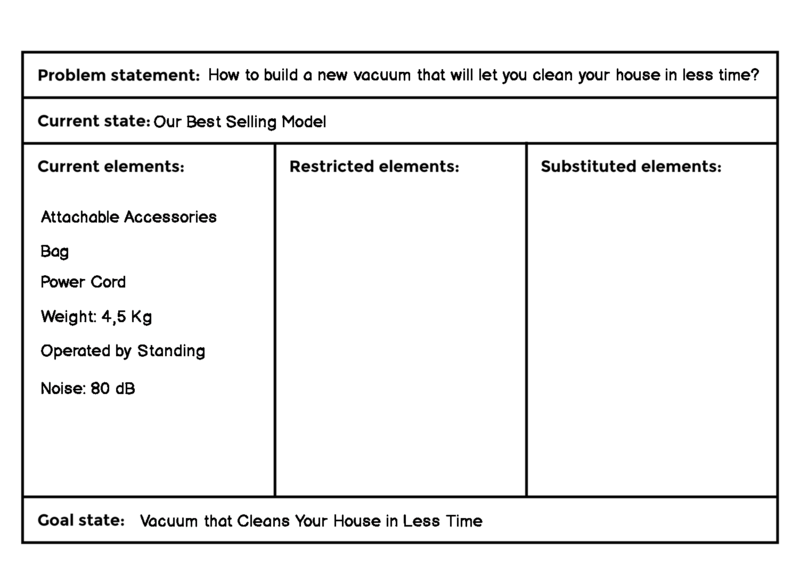 I will show you how to use it in 4 steps, and there is also a free downloadable template for you to fill in. Let’s imagine we go back a decade or so and decide to build a new improved vacuum cleaner. The good old model built by your company is useful and reliable, but it’s time to hit the market with a new model that will leave your competitors behind. 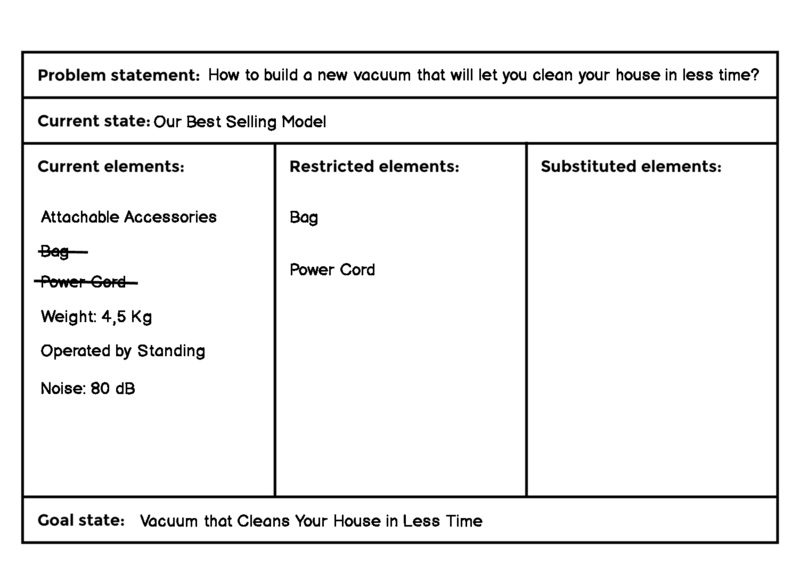 As a problem statement, we might write ‘How might we build a vacuum cleaner that will help clean your house in less time?’. 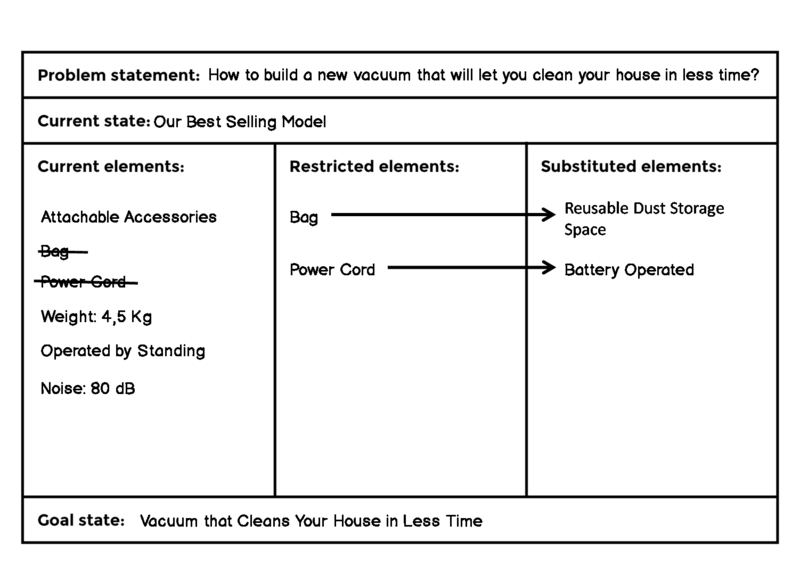 The current state will be ‘our best selling model’, the goal state will be ‘a vacuum that cleans your house in less time’. Then we’d fill in the current elements column, putting in everything you can think of. Now we decide which elements of the current situation should remain and which ones could be restricted. 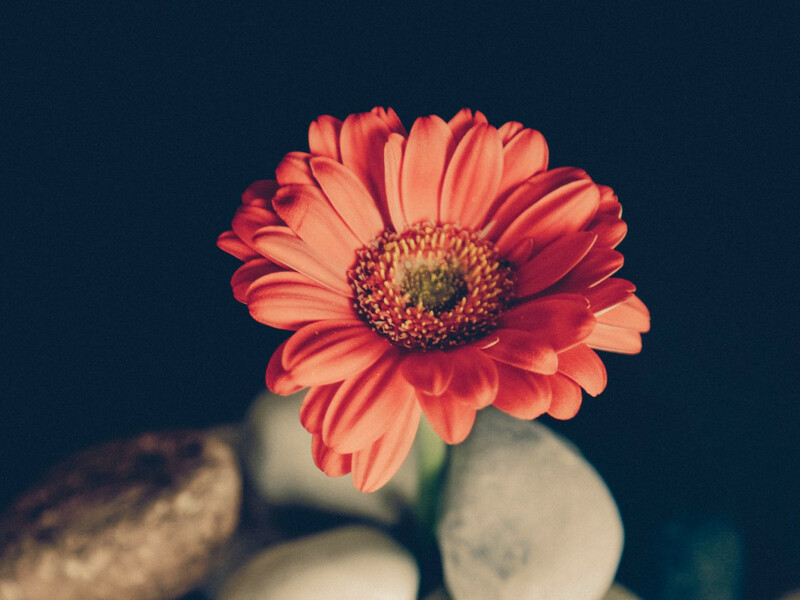 Don’t be afraid to restrict some elements that you thought were absolutely essential: as Brain Clegg and Paul Birch wrote in their book Instant Creativity, ‘creativity is all about breaking unwarranted assumptions’. Always remember that this is a thought exercise, so you can always come back and change the constraints. Be bold. 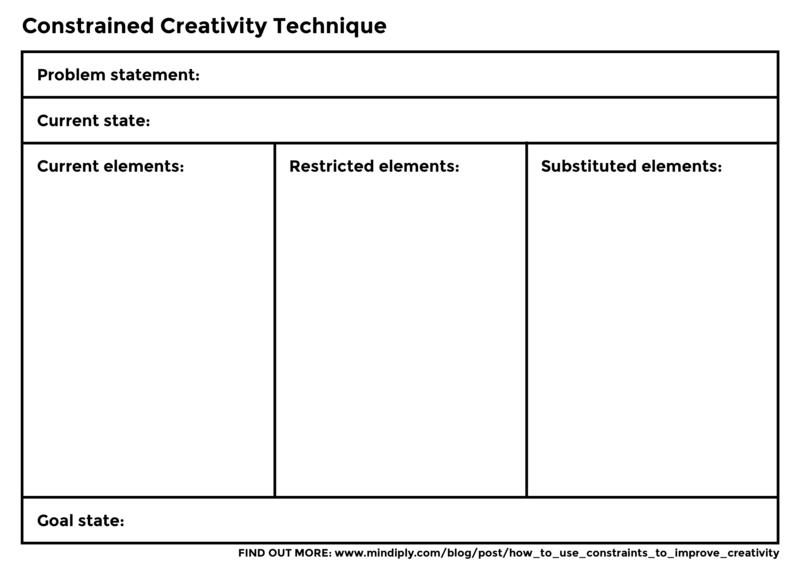 Look at the list of current elements and decide which elements should be restricted. Let’s say that we want to get rid of the power cord, since switching outlets as we change rooms is a waste of time, and what about removing the bag? It would save the time needed for changing bag, so let’s put bag in the restricted elements too. Look at the problem now with the restricted elements: can you find some alternatives to them? This is the most creativity-demanding step of the process. Creativity thrives best when constrained. You’ll find that having the simple act of having restricted some resources will make you focus better on the problem and consider alternative solutions you wouldn't have imagined otherwise. Time to think of substitutions for the restricted elements. When you have all the pieces of the problem in front of you, finding solutions is a very natural process. For example, a straightforward substitute for the power cord would be a battery, so no more cords getting kinked all around. And what about the bag? A reusable dust storage space seems to be a good idea, so no more hassle of changing bags, and users will save also on running costs. Now you can be critical. Are the substituted elements helpful for accomplishing the goal? If the answer is ‘yes’, great! Otherwise, go back to point 3 and look for other substitutions, or to point 2 and change the constraints. You can use some inspiring creativity techniques to get you going. Is a ‘battery operated vacuum’ something your R&D department could work on? Will a bagless vacuum be the next big thing in the vacuum cleaners market? If you are not happy with the results, just take a look at the elements that you have not restricted yet. What about replacing ‘Operated by standing’? This could prompt you to think of a remote controlled or standalone robotic vacuum. If you think that being totally free to let your mind wander is the best way to be creative, you’re wrong. True, good ideas can came unexpectedly out of the blue (ever had a brilliant insight under the shower? ), but, believe it or not, the best way to be innovative is to add constraints to your problem. When people are totally free to solve a problem, they naturally tend to focus on what’s worked best in the past, while when you add boundaries and restrict the availability of some resources (such as materials, skills, money or time) you shape and focus better the problem, and you provide a clear challenge to overcome. 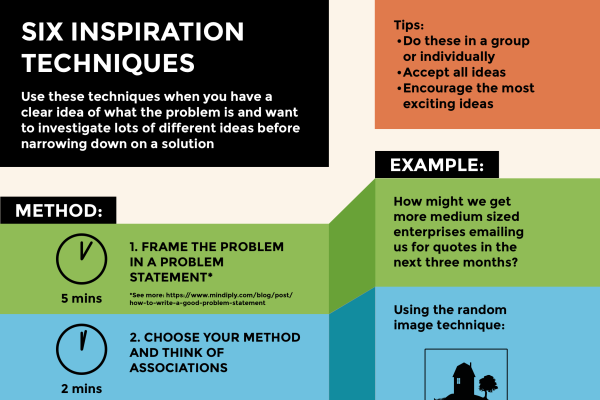 This technique is based on the paired constraint model for innovation developed by Patricia Stokes (Stokes, 2013), a psychology professor at the Barnard College and author of the book Creativity from Constraints: The Psychology of Breakthrough. Constraints are considered as two-sided pairs: one side precludes (restricts) something specific in the current situation, while the other makes you search for a substitute. You start by selecting one thing from an existing situation to restrict, then you identify a substitute. This iterative and incremental process is called ‘Solution by Substitution’. This technique breaks a problem down into the structure of its solution. The act of deciding constraints is itself a big part of the new solution: take again the example of the vacuum cleaner, when you preclude the power cord, then the solution of a rechargeable unit comes in almost automatically. Let us know how you found this technique, we'd love to hear from you.